Tub Doctor Inc. has solutions to make bathtubs easily accessible for elderly and handicapped individuals. 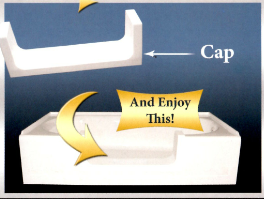 We can retrofit your existing bathtub to have a step through option for ease of use and safety. _What are the benefits of the Walk-Thru Insert? The Walk-Thru Insert is installed using the present tub whether it's made of fiberglass, steel or even cast iron.